BACKGROUND AND PURPOSE: Venous malformations are the most common of all vascular anomalies, 40% of which are found in the head and neck. We discuss results of percutaneous sclerotherapy using bleomycin for facial VMs by using subjective clinical assessment and objective changes on MR imaging. 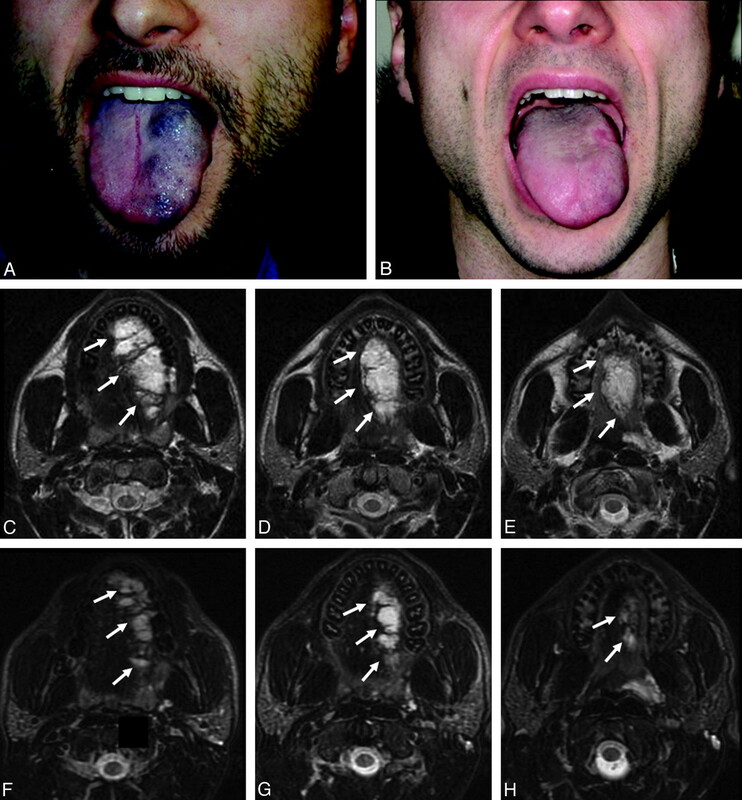 MATERIALS AND METHODS: Thirty-seven patients with facial VMs were treated by percutaneous sclerotherapy with bleomycin. Of these, 31 patients with 32 lesions had pre- and posttreatment MR imaging. Each lesion received between 1 and 9 sclerotherapy sessions (average, 3.5). MR findings and clinical results of treatment were retrospectively reviewed. Clinical results were based on the physician's physical examination and interview of the patient; these were classified as worse, unchanged, or better. Objective results on MR imaging were classified as worse, no change, minor improvement (<50% decrease in size), marked improvement (≥50% decrease), or cure. Objective and subjective results were compared. RESULTS: Twenty-one lesions showed objective improvement on MR imaging. Of these, 10 showed minor decrease in size and 11 showed marked decrease. Eleven lesions showed no change on MR imaging. No VMs were worse or completely cured. Subjectively, 29 patients and 30 clinicians thought that lesions improved. Four of 32 (12.5%) patients suffered minor transient complications. CONCLUSIONS: Percutaneous sclerotherapy by using bleomycin is a safe technique to objectively decrease size and subjectively alleviate symptoms of facial VMs. Subjective clinical improvement is not always associated with visual size reduction on MR imaging. Minimal size reduction or partial fibrosis of the lesion may be enough to achieve subjective clinical improvement. Bleomycin is a cytotoxic antitumor agent, whose sclerosing effect on endothelial cells was applied by Muir et al to the treatment of venous malformations and hemangiomas.7 Since this initial report, a number of studies have been published, supporting both the treatment efficacy and relatively low complication rate.7–9 As it produces only minimal swelling after sclerotherapy (as opposed to ethanol-based agents), bleomycin is especially recommended for treatment of vulnerable areas such as the periorbit or regions related to the airway (ie, tongue and parapharyngeal spaces). Despite the recognition of MR imaging as the technique of choice for diagnosis, a review of the literature revealed that treatment outcomes have, to date, been largely evaluated by subjective appraisal of the patient and their clinicians. Although anecdotally described as a useful tool for measuring treatment efficacy,6 and evaluated in the context of peripheral VM,10 a formal analysis of pre- and posttreatment MR imaging of craniofacial venous vascular malformations in the adult population has yet to be described in the literature. The purpose of this study was to report the results of bleomycin sclerotherapy for facial venous malformations by using subjective clinical assessment and objective changes on MR imaging. A retrospective review, approved by our institutional review board, was completed of the charts of all patients with facial vascular malformations treated consecutively with bleomycin sclerotherapy between December 2005 and March 2009. The following inclusion criteria were applied: 1) classification by preprocedural MR imaging as low-flow craniofacial VM, consistent with the classification of Kaban and Mulliken11; 2) documentation of patient and clinician evaluation of outcome in the chart; 3) availability of pre- and posttreatment MR imaging; and 4) a minimum follow-up of 6 months. The medical charts of these patients were reviewed and the following data were collected: patient demographics, location and number of lesions, number of treatment sessions, dose of bleomycin used at each session, complications, baseline MR imaging, and final follow-up MR imaging. Following the completion of treatment, patients were followed clinically and with MR imaging. Percutaneous sclerotherapy was performed under fluoroscopy guidance (LUA/LCN; GE Medical Systems, Buc, France), sterile conditions, and general anesthesia, by using the negative subtraction technique described previously.12 Twenty-two gram angiographic catheters (Braun, Melsunder, Germany) were percutaneously inserted into the VM until blood return was observed. Phlebography with a small amount (1–2 mL) of low-osmolarity, water-soluble iodinated contrast material confirmed needle position within the VM and assessed venous drainage. Manual compression of draining veins was applied when the venous drainage was toward deep or dangerous/intracranial structures such as the cavernous sinus. The duration of compression in these instances was during injection and for 1 minute thereafter. As a precaution to minimize the clinically recognized risk of pigmentation, thought to be secondary to vessel fragility, tape was not applied to patient skin during the procedure. Bleomycin (Mayne Pharma, Montreal, Canada) was injected into the VM under slow simultaneous digital subtraction at a rate of 1 image every 2 seconds. When the injected material entered the malformation, it replaced the previously injected contrast material, pushing it into the draining veins of the VM, and it appeared as negative contrast (white) on simultaneous fluoroscopic subtraction.12 This technique was used to monitor the bleomycin as it penetrated the malformation, ensuring that it entered the venous pouch and not the surrounding fascia. Additionally, it allowed for immediate visualization should unexpected venous drainage channels open during the treatment process. No attempt was made to manually prolong the retention of bleomycin in the malformation through the use of lesional compression. To prevent postinjection hyperpigmentation, patients were directed to try to avoid trauma to the skin for 48 hours following treatment. Up to 15 U of bleomycin were injected at each session. Sessions were scheduled according to patient availability, but on average took place 6–8 weeks apart. The aim of treatment was symptom palliation and size reduction. Sclerotherapy sessions were repeated until either the patient felt they could tolerate residual symptoms or the clinician was unable to identify any further venous pouches to target with treatment. There were 2 treating physicians involved in ongoing patient follow-up. Each physician documented outcomes in the patient chart according to both their and the patient's perception of response. This was based on physical examination and interview during follow-up at the clinic. Patient and clinician perceptions of treatment response were retrieved from charted follow-up encounters and categorized as 0 (unchanged), 1 (worse), or 2 (better). MR imaging was performed by using a 1.5T magnet (GE Medical Systems, Milwaukee, Wisconsin) with a standard head coil. FSE and fat-saturated T2-weighted (TR = 4000, TE = 90) images were obtained in the coronal, sagittal, and axial planes. T1-weighted (TR = 350, TE = 8) images were obtained in the coronal and axial planes. No contrast was used. Section thickness was 4.0 mm/1.0 mm space, and FOV was between 22.0 × 22.0 and 26.0 × 26.0 cm. Matrix was 256 × 256. The timing of imaging was dependent on availability and patient attendance, and the numbers of days between last treatment and imaging follow-up were recorded. The pre- and posttreatment images were retrospectively reviewed by using FSE and fat-saturated T2-weighted images. Anatomically corresponding images from pre- and posttreatment MR imaging were matched and each lesion was measured in 2 planes to evaluate change in size. Only the pouch (or pouches) of the lesion being treated was measured. All lesions were measured in the axial plane; either coronal or sagittal planes were used to obtain the second measurement, depending on which provided a better view of the lesion. Lesions were classified as either small or large and focal or diffuse. Small lesions were measured as <5 cm and large lesions were measured as >5 cm in their maximum diameter. Focal lesions were defined as those with a circumscribed margin that remained confined to its tissue and fascial plane, while diffuse lesions had an irregular interface with surrounding tissue and infiltrated across fascial planes. Response to treatment was estimated based on measurement in 2 planes, and categorized as follows: 0 = no change, 1 = worse (lesion was larger at follow-up than at baseline), 2 = minor improvement (<50% decrease in size), 3 = marked improvement (≥50% decrease in size), or 4 = cure (lesion no longer visible on MR imaging). After treatment, areas appearing as hypointense on T2-weighted FSE fat-saturated images were not included in the postsclerotherapy measurement. Between December 2005 and March 2009, 37 patients with craniofacial venous malformations were treated at our institution by percutaneous sclerotherapy by using bleomycin. Thirty-one patients (18–62 years; mean, 34.4 years; 14 men, 17 women) met the inclusion criteria stated above. Exclusion was typically because of lack of MR follow-up, due to patient nonattendance. Many of the included patients appeared to have multiple lesions; however, on MR imaging examination, these usually proved to be diffuse lesions with continuous channels. One patient had 2 distinct and focal lesions, which were treated separately and considered as such (31 patients, 32 treated lesions). Fifteen of the lesions were classified as small/focal and 17 as large/diffuse. Fifteen of the lesions were located on the face, including the cheek, mandible, forehead, and lip. Nine of the lesions were on the tongue or intraoral, 4 were orbital, 3 were located in the parotid region, and 1 was in the parapharyngeal region. Eleven of the lesions were treated for cosmetic improvement, 9 for swelling leading to oral obstruction and dysphagia, 6 for swelling causing mass effect, 5 due to pain, and 1 for recurrent hemorrhage. The hemorrhage was presumed to be related to lesion thrombosis and surface ulceration, as the patient was unable to recall any precipitating trauma and the presence of a craniofacial arteriovenous malformation had been ruled out by digital subtraction angiography. Of those causing oral obstruction, 3 also developed orthodontic problems secondary to VM enlargement. Of the 31 patients, 20 had been treated before the review period for their VM, either by surgery, sclerotherapy with alcohol, or by laser treatment. Fifteen patients of 20 were treated by 1 technique, 4 of 20 by 2 modalities, and 1 of 20 had been previously treated by using all 3 of these modalities. These previous treatments took place a minimum of 2 years earlier. Each patient received between 1 and 9 sclerotherapy sessions (average, 3.5), with a total of 111 bleomycin treatments among 31 patients. The dose of bleomycin administered per session ranged from 2 to 15 U, with an average of 10.5 U. Imaging follow-up ranged from 42 to 515 days after the date of the last sclerotherapy session (average, 156 days; SD, 125 days). Most of the patients had their imaging follow-up at 50–100 days after the last treatment. Timing of follow-up was similar for each of the clinical (better, worse, and no change) and objective (>50% decrease in size, ≤50% decrease in size, and no change) outcome groups, and there was no correlation between timing of follow-up and patient outcomes. In support of this, there were no patients who, either clinically or objectively, worsened in the time period between last sclerotherapy session and MR follow-up. Four patients developed complications secondary to treatment, none of them permanent. Of these, 1 developed an infection of the orbit that resolved with oral antibiotic treatment, 1 experienced moderate nausea that resolved after several days without treatment, 1 experienced severe nausea and vomiting that resolved with intravenous fluid administration, and 1 had temporary skin discoloration over the injection site that lasted for 1 month and resolved without treatment. Subjectively, in 29 of 32 (90.6%) cases the patients and in 30 of 32 (93.8%) cases the clinicians thought that the lesions improved. Twenty-one of 32 lesions (65.6%) showed objective improvement on MR imaging (Figs 1 and 2). Of these, 10 of 32 (31.3%) showed minimal decrease in size and 11 of 32 (34.3%) showed marked decrease. Eleven of 32 (34.3%) lesions showed no change on MR imaging (Fig 3). None of the VMs were worse; however, neither was there complete cure. In terms of signal intensity change, 16 of 21 (76.2%) of those lesions that decreased in size maintained the same appearance on T2-weighted images, with hyperintense pouches and no extra septations. Only 5 of 21 (23.8%) demonstrated areas of fibrosis, as evidenced by areas of isointensity on T2. 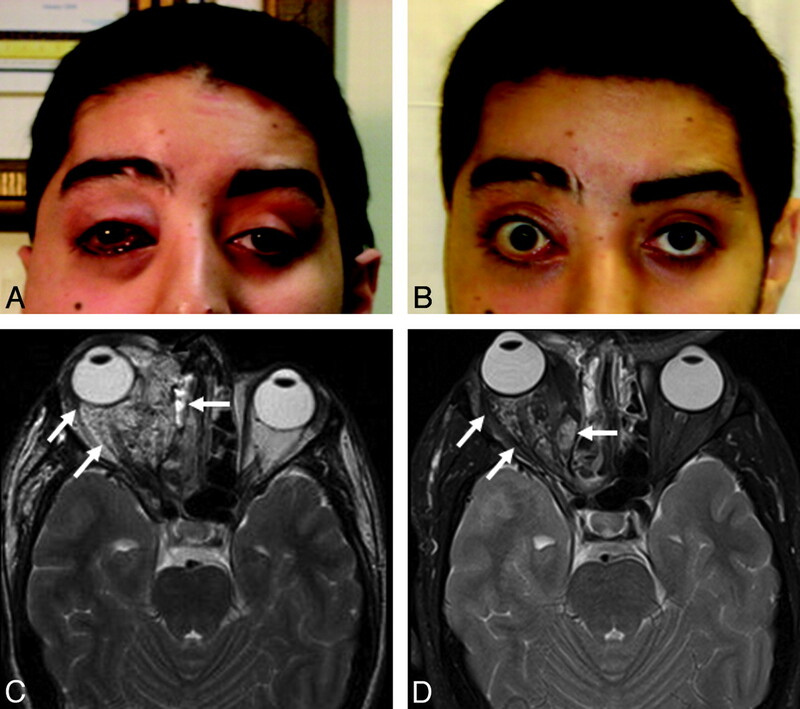 Twenty-six-year-old patient with a focal, large intraorbital venous malformation who presented with proptosis and cosmetic concerns. Pretreatment (A) and posttreatment (B) photographs demonstrate significant reduction of proptosis and conjunctival congestion. Pretreatment (C) and posttreatment (D) fat-saturated axial T2-weighted MR images at the level of the orbits demonstrate marked reduction in the size of the VM (white arrows). The patient was extremely satisfied with the results of treatment. Twenty-five-year-old patient with a large diffuse venous malformation of the tongue extending into the neck, who presented with swelling that resulted in dysphagia and oral obstruction. Pretreatment (A) and posttreatment (B) photographs demonstrate a visible reduction of the size of the lesion. Pretreatment (C–E) and posttreatment (F–H) treatment fat-saturated axial T2-weighted MR images at corresponding levels of the oral cavity demonstrate a marked reduction in the size of the VM (white arrows). As a result, the patient experienced substantial clinical improvement. Twenty-two-year old patient with a large diffuse venous malformation of the right cheek and oropharynx, who presented with swelling leading to oral obstruction and obstructive sleep apnea. Both components of the lesion were treated. Presclerotherapy (A) and postsclerotherapy (B) fat-saturated axial T2-weighted MR images at similar levels of the maxilla show no significant change in the size of the cheek (white arrows) and intraoral (white arrowheads) portions of the lesion after 9 sessions. Despite this, the patient was extremely satisfied with treatment, noting a decrease in swelling and oral obstruction. He also appreciated an improvement in cosmetic aspects of the lesion, noting more symmetric facial contour subsequent to treatment. Additionally, the otolaryngologist who referred him noted a subsequent improvement in sleep disordered breathing. This decrease in lesion swelling likely represents a change in the physiology of the lesion, rather than its anatomy. There was no correlation between treatment outcome on MR imaging and the amount of time between last treatment and reimaging, with the average number of days for the no change group being 144, the minimal change group being 138, and the marked change group being 168. The efficacy of this treatment has been evaluated by a number of different measures. These include qualitative measures, such as patient survey, review by the clinician of photographs taken before and after the treatment, and clinician documentation in the chart. In their evaluation of the treatment of hemangiomas and vascular malformations with intralesional bleomycin, Muir et al7 described 95 patients, 31 of whom had venous malformations. Treatment results of patients treated for reasons of cosmetics were evaluated by comparison of color photographs taken before, throughout, and after completion of treatment, and they were classified by using the following categories: complete resolution, significant improvement, fair (moderate) response, and no response. Outcome of patients treated for lesional pain was defined in terms of degree of improvement in pain by patient self-report. Using these criteria, they reported complete resolution in 32% and significant improvement in 52% of patients treated. Side effects of treatment were relatively infrequent (occurring in 8 of 95 patients) and inconsequential, consisting of flu-like illness, ulceration, cellulitis, and partial temporary hair loss. Consistent with these findings, our examination of pre- and postsclerotherapy MR imaging found that, despite a perception of treatment-related improvement in 90.6% of patients and 93.8% of clinicians (results comparable to those published in the literature), MR imaging demonstrated marked or minor decrease in size in only 65.6% of cases. One explanation for this discrepancy could simply be placebo effect, though the presence of such an effect is not supported by the consistency of clinician and patient perceptions of outcomes. Another explanation for the discrepancy between subjective results as perceived by patients and clinicians and the objective results as seen on MR imaging could be found in the actual nature of each method of evaluation. While patients and clinicians mainly evaluate the external appearance of the lesion and control of symptoms, MR imaging evaluates the anatomic size and extent of these lesions. The external appearance and other symptoms may be corrected with even minimal reduction in VM size or slight fibrosis of the lesion, leading to a decrease in swelling. In any case, follow-up MR imaging makes it clear that these changes do not reflect complete cure. Thus, the subjective cure or near-cure rates reported in the literature7–9 by subjective evaluation likely do not reflect an anatomic cure. Nonetheless, 65.6% objective improvement according to MR imaging is a significant result, which demonstrates that sclerotherapy with bleomycin is an effective technique. Reported complication rates for percutaneous bleomycin sclerotherapy in the literature range from 8.4% to 14.7%.7,9 Because most patients undergo multisession therapy, per patient complication rates are significantly higher than per session rates. Consistent with this, our study found per session complication rates of 3.6% and per patient complication rates of 12.9%. Despite this, none of the patients treated with either agent experienced permanent impairment or disability secondary to treatment. Given that clinical outcomes are commonly divided into relatively arbitrary categories, and that sclerosants and techniques used vary widely, it is difficult to compare our results to previously published work. Nonetheless, our findings and complication rates are similar, confirming the utility of percutaneous sclerotherapy by using bleomycin for symptom alleviation of craniofacial VMs. Sclerotherapy by using bleomycin is an effective treatment for craniofacial venous malformations. After treatment, objective decrease in size on MR imaging is less common than subjective clinical improvement in symptoms. Treatment does not result in complete cure on MR imaging. The observed discrepancy between objective and subjective treatment response may be due to placebo effect. If it truly reflects response to treatment, the implication is that in many cases a minimal size reduction and/or a change in the physiologic characteristics of the lesion are enough to achieve clinical improvement. In any case, although MR imaging is useful to confirm diagnosis, it is probably not required to show treatment benefit. We wish to thank Drs. Blake McClarty and Dana Iancu for their support and mentorship as well as the James Pullar Memorial Trust and the Dr. Paul H. T. Thorlakson Foundation Fund of the University of Manitoba Office of Research Services for student stipendary support.